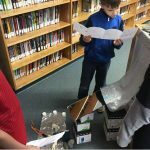 South Slope/ BCSD Library | News about the library and more! 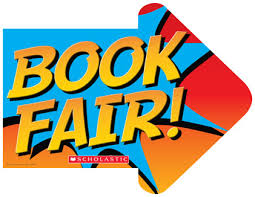 The Scholastic Book Fair will be here Monday, March 5th until Thursday, March 7th! Parent volunteers needed. Please sign up outside the library or speak to Mrs. Araujo. Come and find a great book and help support the school library. Thank you! 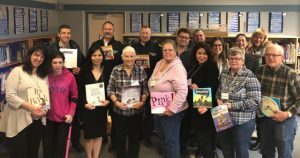 We had a wonderful week celebrating literacy in January. We hope you have had the chance to visit our “Response Gallery” to see all the different ways classes responded to our school wide read, Drawn Together. Thank you to all the families who donated books for book swap. We had a lot of fun dressing up as our favourite literary characters. 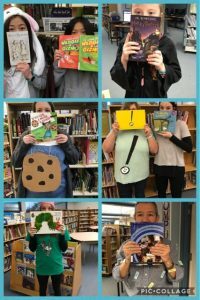 On Thursday, guest readers and ASL storytellers visited each classroom to share their love of reading. What a fabulous week! You may have noticed some changes in the library lately. 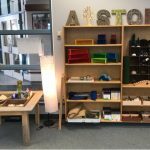 We have moved around some things and made a special place for students to tell and write stories with a variety of materials and loose parts. It has been an exciting adventure that began with Ms. Shuster and Division 9 visiting the story studio once a week. Now Division 7 is visiting the Story Studio. 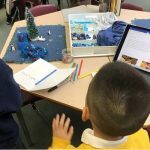 Using the Story Workshop structure, students are exploring many Big Ideas in Language Arts including: language and story can be a source of creativity and joy. 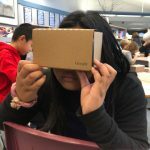 This year Mr. Hunter and I are part of a district learning team exploring how using Virtual Reality(VR) and Augmented Reality(AR) can provide experiences for students that allow them to make connections to curricular content and competencies in unique ways. For 2 weeks in February we have a kit of 30 Google Carboard glasses and 30 smartphones we are using with students. Division 5 is using this technology to help their understanding of key science concepts. We are hoping to give as many classes as possible the opportunity to experience these amazing tools for learning. The book fair will be returning March 4-7. Parent volunteers are needed. Stay tuned for more information. 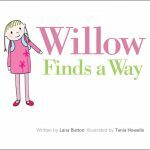 Author Lana Button will be making a presentation to our primary students on March 14th. Thank you to the PAC for helping to fund this event. Congratulations to all the nominees. We enjoyed reading all of you! 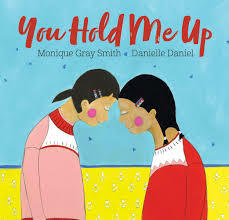 These books were chosen from the list of nominees for the Governor General Literary awards and the Marilyn Baillie Picture Book awards. Fort Langley National Historic Site is pleased to welcome Inuit storyteller Michael Arvaarluk Kusugak for a special afternoon of Arctic Stories. 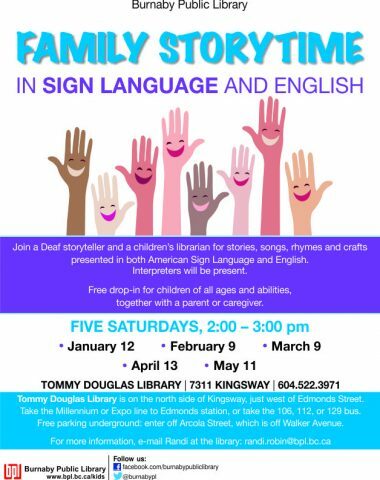 Join us on Saturday, December 1st at 1 p.m. for this all-ages storytelling event. General seating in the theatre; arrive early to choose a seat. The event is included in the regular admission fee, or pick up your earlybird annual pass at the Visitor Centre. Michael Arvaarluk Kusugak grew up in Repulse Bay, NWT (now Nunavut) and now splits his time between Sooke, BC and Rankin Inlet, Nunavut. 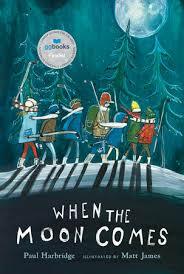 During his childhood, his family travelled by dog sled, living a traditional Inuit lifestyle. 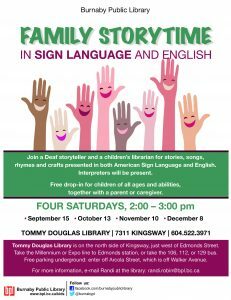 He is an award-winning author of twelve children’s books and was a co-writer of A Promise is a Promise (with Robert Munsch). Parks Canada invites Canadians to be inspired and captivated by the stories of the people and events that shaped the Canada of today. 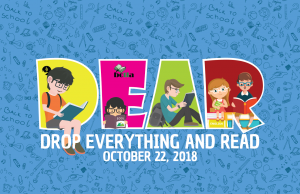 On Monday, October 22nd we will be joining thousands of readers across the province as we participate in the Drop Everything and Read challenge. 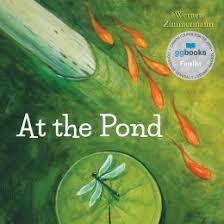 We are inviting everyone to wear their PJs so we can get cozy as we all curl up with a book after lunch. 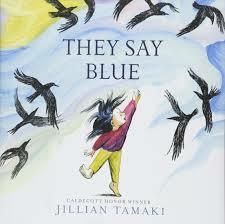 Come and visit the school library if you need a great read for Monday or any day. 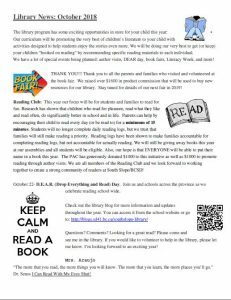 We are looking forward to celebrating as a community of readers! 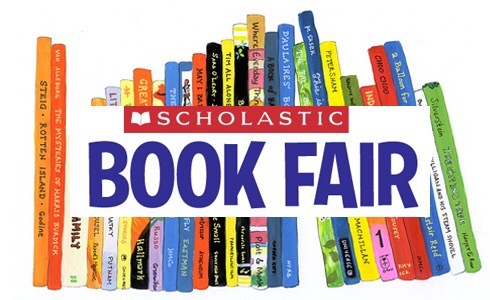 Next week, September 17-20, the Scholastic Book Fair will be coming to the library. 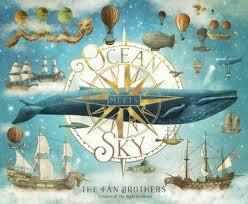 We hope you will visit and find a great book and support our school library. 60% of book sales go towards new resources for the library! Parent volunteers are needed. Please see Mrs. Araujo in the library and/or check the sign up sheet in the hall just outside the library.